Being brother and sister, my two littlest ones can never agree on what to see at the movie theater. Today – on Black Friday of all days – was no exception. After drawing first blood, my son won out. 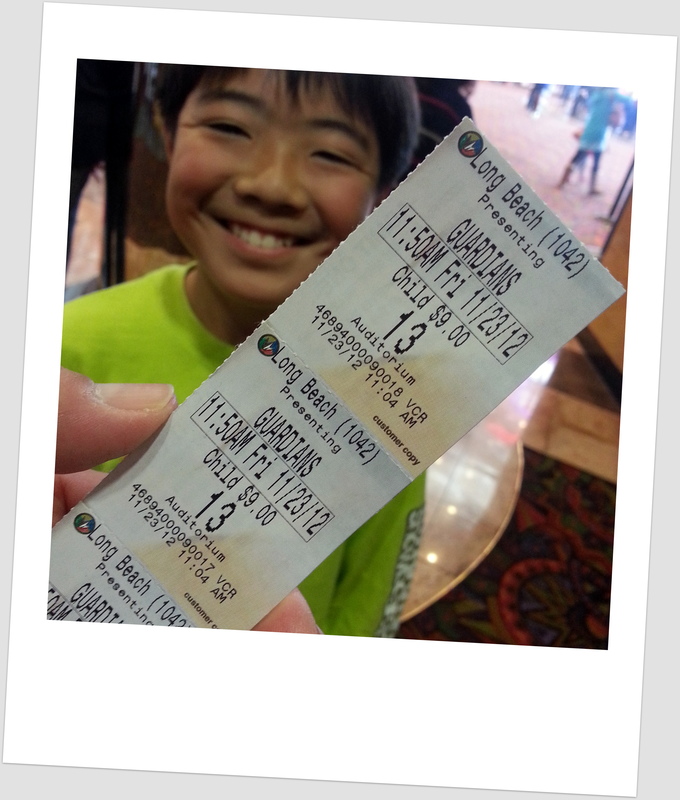 We saw “Rise of the Guardians”. Once and only once, Papa here won out. Well, the two kids actually had no choice. We saw “Captain America”. But the first movie I truly recall seeing – at a drive-in with my folks – was “War of the Worlds”. I still love it. But “back then”, a movie was a movie. But before “back then”, a movie was truly magical. The director and cinematographer worked together to bring you into their minds. You had to use your imagination and senses to enter it. Plus costume design. Makeup. And “special effects”…primitive by today’s CGI mania standards yet so wonderful. “Wizard of Oz” is likely the best of the best. Shot in 1938. Entirely on SETS. It sits at the top of my (humble) list. Regardless, a movie is to entertain. I don’t look for special subliminal meanings or hidden messages. While the theater wasn’t crowded (perhaps due to the seven buck bags of crappy popcorn from China…with fake butter) for our showing, there was a very cheerful round of applause at the end of the movie. From children, parents and grandparents alike. I guess they were entertained. sounds like a lot of fun -the $7 crap popcorn with fake butter…ahaha! Question: can you see a comment from me on your blog? New films are stunning with their effects but Metropolis still blows us away. You’re so right about having to immerse yourself in old movies to get the best out of them. Sorry… didn’t follow your thought on Metropolis… Superman? Otherwise, you used your imagination to fill in the blanks with the classics. Today, there is little left to imagine with all the CGI…which is kinda sad in my humble opinion. I agree, that was my thought exactly! I also agree that the older movies were much better than today. Did you happen see the preview for movie about the Wizard of Oz? It looks like it is about how the wizard got to Oz. There is a reboot on the Wizard of Oz? we saw the previews when we went to the movies on Friday..I think it is called OZ and it looks like it is how the wizard got there. Not sure yet if I will see it. There is also a remake of the Lone Ranger that looks great coming I think early 2013. The remake of the Lone Ranger may do well at the box office – it has the heartthrob of many a woman: Johnny Dep. And now you’ve sparked my interest on the “pre-Dorothy” Oz movie! I am not a Johnny Dep fan but I do love the Lone Ranger, hopefully Hollywood won’t mess this up. TWO????? No chocolate covered raisins????? ?